The 21st Century has definitely been an interesting time for Subbuteo. The iconic football brand was on the point of dying back in 2000, and yet it has refused to do so. 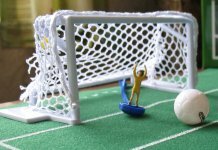 The internet has certainly played a part, bringing together players and collectors from around the globe, and proving that there is still a market for table soccer. 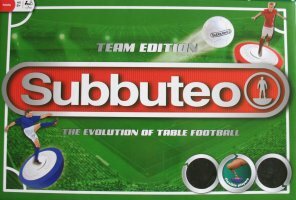 The new 2012 version of Subbuteo is the fifth or maybe the sixth official version of the game since 2000. To recap, we've had the Hasbro sets of 2000-01, which were essentially a continuation of the 1990s production; the Parodi set and teams of 2003-05 produced for the Italian market; the "Photo-real" sets of 2005-07, for the UK market and clearly aimed at kids; and the Marks and Spencer set of 2009 aimed at the retro-market. There was also a 2009-11 magazine partwork in Italy, which, whilst fundamentally a team collection, did allow a set to be built up. (the M&S set borrowing these items). The new production is once again aimed at children (aged eight or over), and families in general. Licensed by Hasbro, it is manufactured by a Spanish company, Netcam Iberia Valores SL, although it is unsurprisingly made in China. Like Subbuteo of old, this version will be distributed by local companies in different countries or regions. Distribution in UK and the Republic of Ireland is by Paul Lamond Games Ltd, whilst different teams have been produced for different markets. The new box is a bright, bold design, and perhaps the key thing is the confidence shown in using the brand to sell the game. Okay, if you want real footballers on a box these days, you sadly have to licence them, but this is essentially a giant logo. The only other thing illustrated are a couple of generic footballers positioned on iconic Subbuteo bases. The box seems to be saying "This is Subbuteo, so you already know what you are getting". Which is probably true for the parents buying the game, if not their kids. The box does have two circular windows to show off the players. This has a two-fold benefit. It shows that, yes this is real Subbuteo, and not the flat "photo-real" version, but it also shows that players are a new design, and that this is not simply a retro set. The box is the usual "modern" Subbuteo size. Smaller than pre-Hasbro boxes, it will fit in a shelf with any other post-1996 sets you might already own. As with the M&S edition of 2009, the box is not shrink-wrapped, and the lid is simply held on with tape. From the outside, it seems a good quality, solid box, but once you open the set, you realise that it is constructed in cheap corrugated cardboard. Unfortunately, this is the start of a run of design decisions, which all suggest that "cheap to produce" was set too high on the agenda. Inside, the contents are housed in transparent plastic, with the pitch stored underneath. A sensible arrangement, and better than most older Subbuteo sets. However, the design has the unfortunate side effect of highlighting just how little you get for the money - no flags, only one ball, and no substitutes. The two players showing in the windows are part of the two teams, so elsewhere in the box the teams only have nine outfield players - which again seems to highlight what is missing, rather than what is there. Overall though, the insert looks quite nice, and all is well.... until you try to remove the contents. Just like the individual team sets (shown elsewhere on the site) the plastic insert seems designed to hold the players securely, but to not actually let the owner take them out. Now there is a knack to removing the players, but I got so fed up with struggling, that mine are permanently housed in the heap within the big space where the goals live. Disappointingly, this set is extremely stingy with its ball allocation. One ball? All old Subbuteo sets have at least two balls, and the M&S set had three. It's so easy to lose or break a ball, that it seems insane to not provide a spare. The ball has a single black logo, which has both name and Subbuteo icon within it. Superficially, it looks like the ball in the M&S set, although that lacked the player logo. However, the two balls are worlds apart. The M&S ball was a traditional Subbuteo ball, with thin plastic, and thin patterning. In contrast, the ball in this set is a too chunky. I suppose fits into the general "toughness" of the set, meaning it is less likely to break, but the thick plastic and thick pattern mean that it is not really suitable for serious adult players. The touch seems way too heavy, and close control is therefore difficult (this could just be me!). The goals fit the chunky theme, with big round posts, and a thick (but rather attractive) net. They are pretty much identical to the goals in the "photoreal" sets, except that the net has bigger holes, and the base is now white rather than green (although they are shown as green on the rules/packaging). Actually there are a couple of further minor differences, suggesting a new mould. Sadly, they have kept the annoying low back bar, meaning that the goalkeeper can't reach the top of the goal. You're basically stuffed if your opponent can chip the ball. The base extends out at the sides, to provide a finger grip to keep the goal steady. If you are making a more stable/permanent set-up, you will have to make your own screw-holes, but at least there is room for this. The rule sheet is a simple four sides of A4. Flicking is hardly explained. Perhaps it was thought to be obvious, but I'm not sure that it is for newcomers. It does say that "you may not use your thumb to brace your hand", which I usually do. Surely the rule was that you can't use it as a spring? Of course, there are differences. Touching ball or player with your defensive flick results in a free kick (it's just a "back" in table soccer), and these free kicks are direct if in the shooting area. Players are flicked into position at goal kicks, rather than placed, and offside is dealt with differently too. Amusingly, the goalkeeper takes any goal kicks by "flicking the playing handle". This always seems to go wrong frankly. Use a full back or a spare figure. The other piece of paperwork is a "club card" to join "Club Subbuteo". Just sign-up online. The website talks of benefits, but doesn't explain what they are. In fact, the website is entertaining, but still a little half-hearted at present, with the product list being surprisingly incomplete, compared to what is currently available. 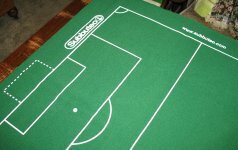 This is the standard single-sided felt playing surface seen in most 21st century table soccer sets. It's trumpeted on the box as a "new and improved" surface, and it certainly is better than the horrible nylon pitches in Subbuteo sets in the 1980s-90s. So the claim is true for casual buyers. The lines/markings, are very thick. As with the balls and goals, this might be an issue for serious table soccer players, but it shouldn't be an issue for the casual market. The pitch seems to play fine, and takes polished players very well. However, I was getting some strange reaction when I first put polished players on the pitch. Sliding them across, I was sure I was getting static electricity building up. You could hear it, and I did get players jumping rather oddly. It settled down once I started playing. Has anyone else experienced this? This is where the new Subbuteo differs from the previous sets. At first glance, the players are the familiar size and shape, but actually they are a new figure, and more importantly, a new material. These figures are made of a very rubbery plastic, meaning that it is much harder to break them, and so the curse of broken ankles will be much less frequent. They are also a new design, aiming to to look like modern players with short-sleeves and longer shorts. Actually, both "new" concepts will be familiar to the modern table soccer player. The rubbery players made their first appearance in Netcam's own table soccer clone - Total Soccer, whilst the "new look" players are clearly copied from Stefan Corda's popular 2K4 figure. Personally, I prefer the look of Netcam's Total Soccer figures, and I wonder why they changed it. The different hair styles look tacked onto the 2K4 (which I suppose they are), whereas on the Total Soccer players they look a bit more natural. The bases are new to this set. They are a two-part, weighted base, as per the standard Subbuteo lightweight of the 1980s, but they have a profile closer to Hasbro's bases of the late 1990s - i.e. lower height, and a wider bottom for a sliding style of play. The bases do allow you to curl the players to some degree, which is a skill sadly lacking from the modern table soccer game. Disappointingly, the build quality (or maybe the quality control), is poor, with some ill fitting pegs/bases, and some slightly bent player figures. These can be coaxed into shape by a careful adult, but we should not really have to be doing this. July 2013:- Pleasingly, my later team sets seem to be better in this regard, so perhaps these issues have been sorted out. The Rest of the Range. The box set is backed up by a range of individual teams, which was always one of the great joys of Subbuteo. The range is split between officially licenced teams, and generic kits. At present, the UK licenced teams are Manchester Utd, Liverpool, Chelsea, Manchester City, Arsenal and Spurs plus Celtic and Rangers. The generic kits fill the gaps, with black and white stripes (Newcastle etc), red and white stripes with black shorts (Sunderland etc), claret and sky blue (Aston Villa, West Ham etc), and blue and white stripes, blue shorts (Wigan, Brighton, etc). The are further international teams, that seem to get away with being unlicenced, with England, Scotland and Ireland. No Wales, but the red and white team in the box set would do nicely. See the Netcam Subbuteo page for more details of this range. In conclusion, the new set is rather a mixed bag. As you've hopefully picked up from my descriptions, I have a number of niggles with the set, and there are certainly areas for improvement. The most annoying thing is definitely the difficulty in getting the players out of the boxes. The fact that the players can arrive looking bent at the ankles, and so have to be nursed into the correct pose hardly inspires confidence. It's frustrating, because it only really needs a few tweaks to be so much better. However, once off and running, this is a very playable set, and a decent quality of Subbuteo match can be achieved. In truth, there isn't much here at present for collectors, or for existing players. However, it is still a very important product. An entry level, mass-market table soccer set is very much needed if the game is to pick up new fans. 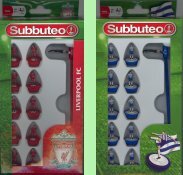 Subbuteo is such a well-known, and much loved game, that a proper Subbuteo badged set will sell the game in a way that sadly, other non-branded versions cannot. The tough players and accessories also make this an ideal set for younger players. If the game gets out to the right places, and at the right price , then it could be a success. Then if new players then want to take the game to another level, that's when they can discover all the niche products that make up the rest of the table soccer market. Better pitches, better balls, better bases..... All these things are available online. I would suggest that the usual £39.99 price tag is too high for what is included, and that the £20 sets in Tesco during the summer were much more like it. A competitive price, at a popular supermarket seemed a good way to raise the profile of the game. However, the subsequent Tesco discounting to £7, followed by the removal of the game from their range, was not a good sign, and it is also disappointing that I have yet to see the individual teams in a shop. Online only is not yet the way forward in my opinion. (If you picked up a set when Tesco then discounted to £7 - well done! ).